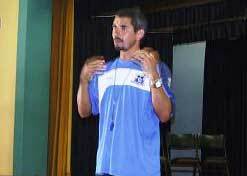 United’s assistant coach, Clinton Larsen gave a motivational talk to learners from Newton High School recently. His talk was based on the importance of focusing on ones future and having a vision to cope in an global society. He gave his audience a glimpse of his back ground. He came from a township that was a breeding ground for gang wars, abuse of drugs and alcohol as well as other social ills. But he had to make decisions that allowed to him to make a better life for himself and it demanded a focused vision. In Larsen’s words “The way forward for all of you is to value the education because without it in this ever changing world it will become difficult to survive and can lead to a miserable existence. After the talk Newton’s first team played Uniteds U15 played a friendly game which Newton won 2-1. Clinton Larsen on stage giving his motivational talk at Newton High School. 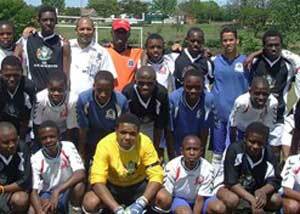 Newton High School (black/white) and Uniteds U15 teams pose for a photograph before kick-off.